Verdure au Chateau - Detail shows a scene based on the original "Royal Residences" created by the Gobelins Manufacture for King Louis XIV. In this era of French tapestry production, King Louis XIV (1638 - 1715) encouraged the growth of art and the Gobelins tapestries created under his rule became some of the most beautiful tapestries created by Europe. Here we see the detail from the larger work "Verdure au Chateau" which shows a gorgeously ornate balcony decorated with a drape and a violin to portray the life and times of royalty in this era, as the scene leads the eye to the chateau in the background. In the cleared path to the distant castle we see a group of horse drawn carriages on their way to the chateau. The scene is decorated with an ornate leaf and floral motif border. 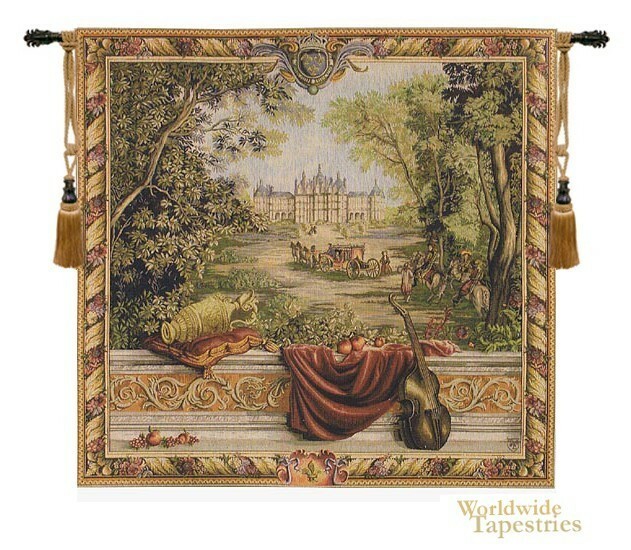 This tapestry provides a window into the world of French chateau landscape and scenery in this beautiful work. The Verdure au Chateau - Detail tapestry is backed with lining and tunnel for easy hanging. Note: tapestry rod and tassels, where pictured, are not included in the price.